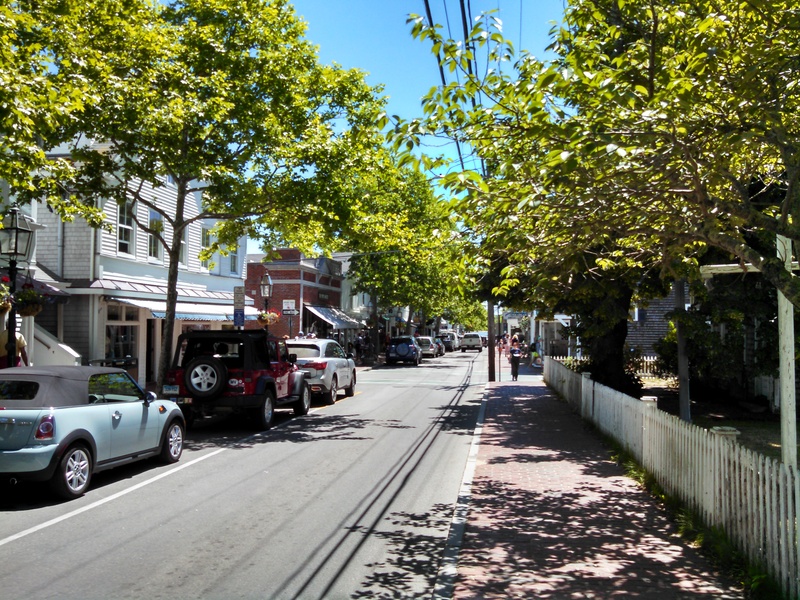 This is a view from upper Main Street heading down to the dock in Edgartown. 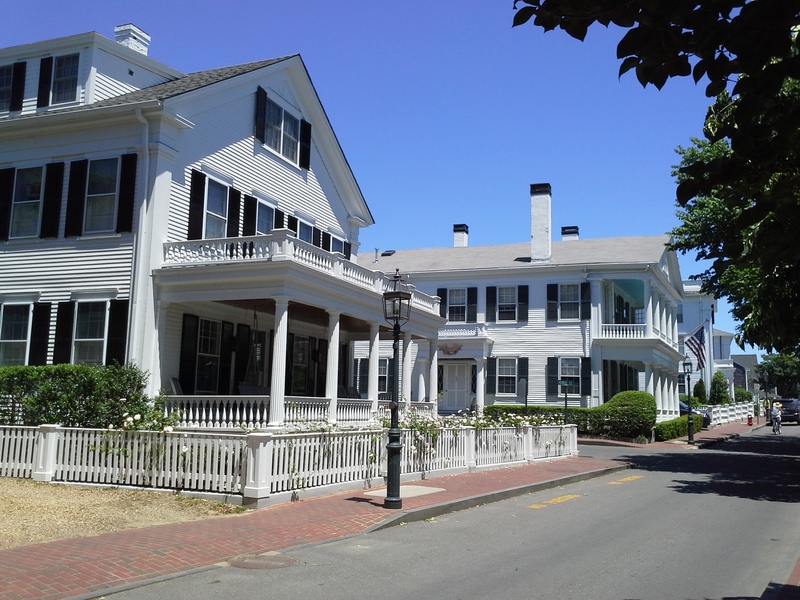 It was reported years ago that Edgartown’s architecture and streets were used to design a classic small town set for movies made in Hollywood. As you wander with us throughout the town you’ll see why. 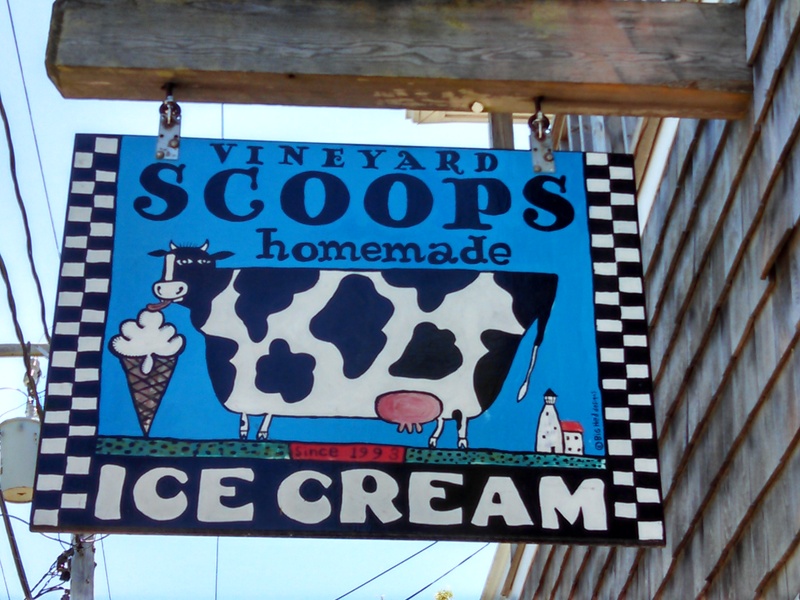 But first, we must give kudos to Rorie, who encountered (and passed bravely by) her first two sweets seductions of the day – the “udderly” fabulous Scoops and The Ice Cream & Candy Bazaar. We continued down Main Street to the intersection of North and South Water Streets. This is the beautiful Victorian Inn on South Water Street. 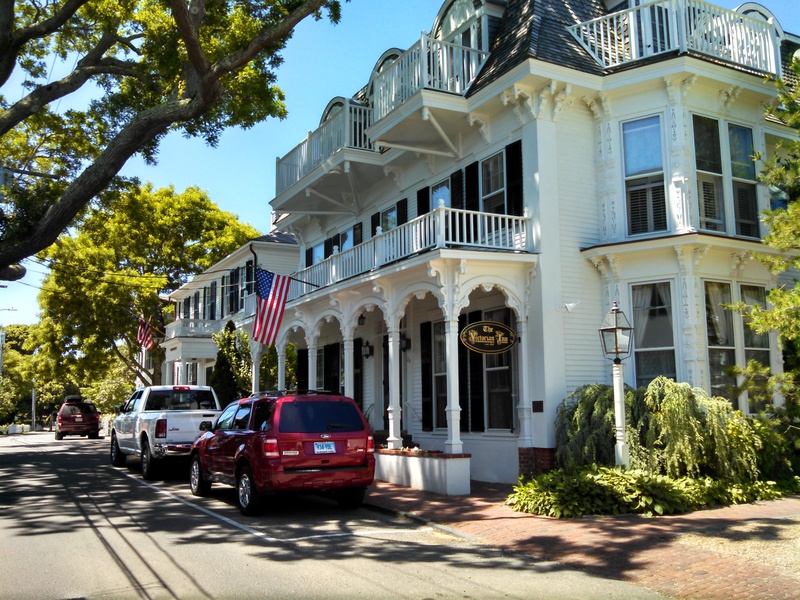 It’s a restored whaling captain’s home owned and run by Innkeepers Stephen and Karyn Caliri. 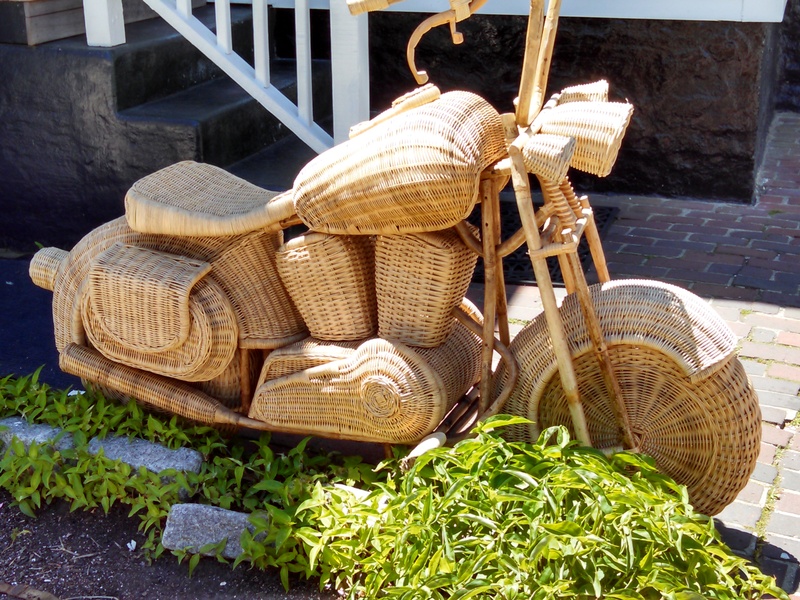 We found some cheap transportation across the street from the Victorian Inn and adjacent to the Harborside Inn (By the way, if you’re ever in Edgartown, stop by the Harborside and say “hi” from Rorie and Bart to Margerie at the front desk. She’s a wonderfully warm and kind woman who’s always wearing a bright smile). 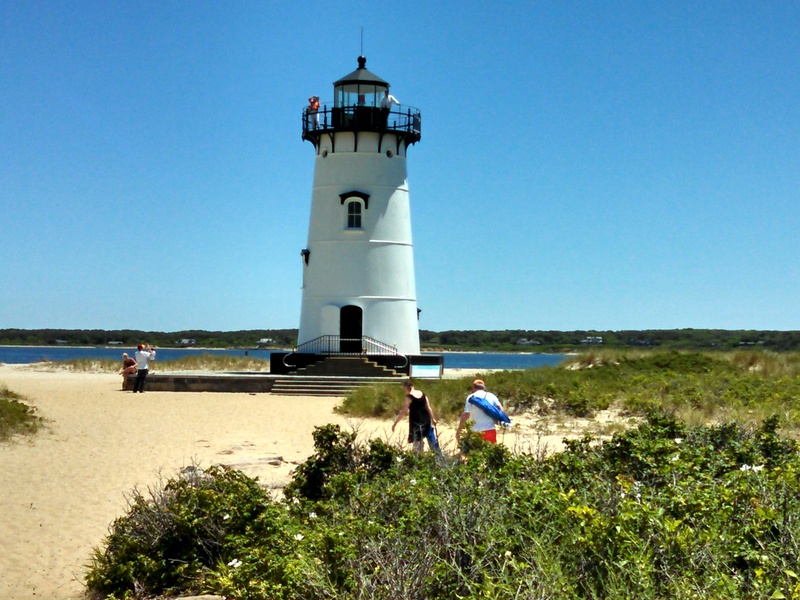 The Edgartown Lighthouse is just a short walk from the harbor end of Main Street. 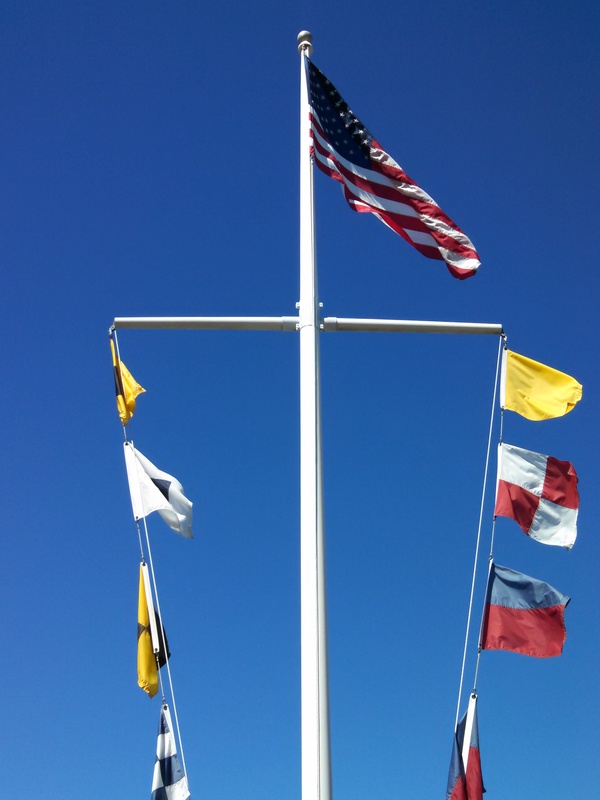 Like so many old lighthouses in America, it has a rich history. That’s the Island of Chappaquiddick in the background. 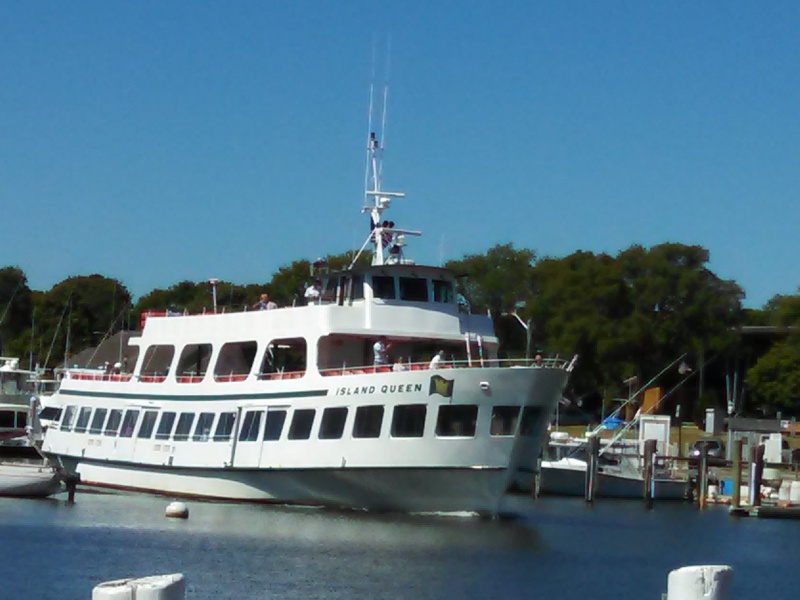 Small ferries go back and forth nonstop in season from Edgartown to “Chappy”. Until 2007, Martha’s Vineyard and Chappaquiddick were connected by a 2 mile long strip of land. In April of that year, a strong storm separated the 2 islands by creating a 300 yard channel. 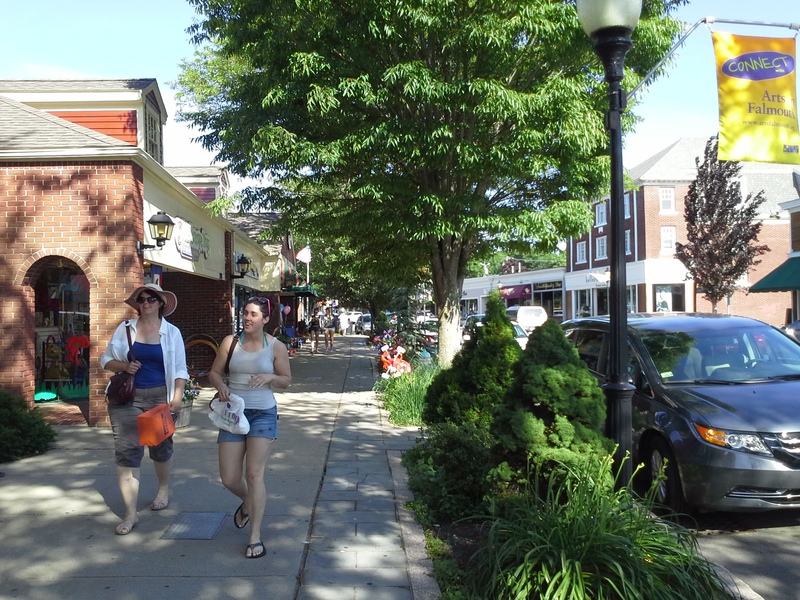 Kelly Street runs parallel to Main Street and draws a lot of visitor foot traffic to its shops, restaurants and hotel. 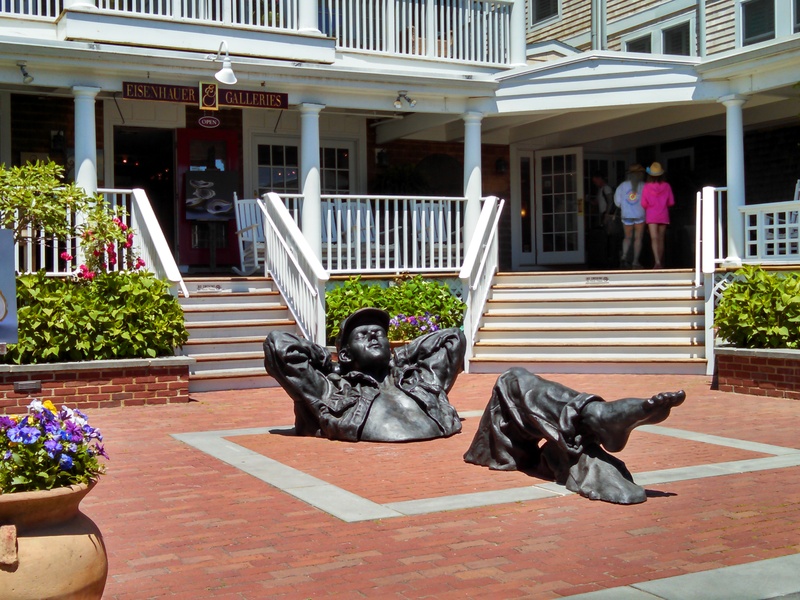 We discovered this sun bather, who seems to have had some major liposuction, relaxing in front of the Vineyard Square Hotel & Suites (formerly the Colonial Inn). We continued our exploration of the town’s exquisite architecture on North Water Street. 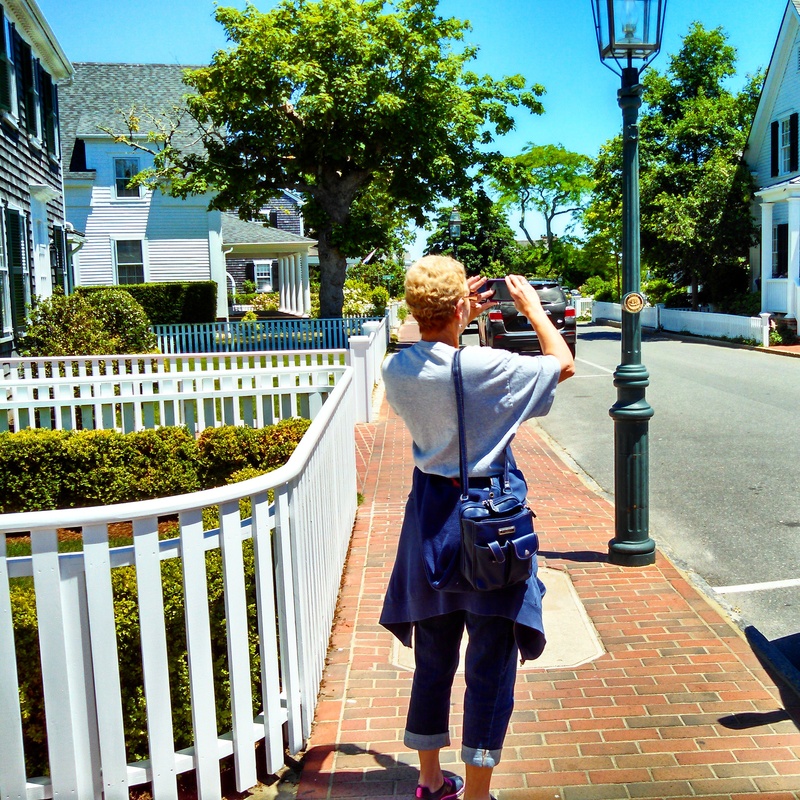 Here’s a photograph of Rorie taking photographs of an old whaling captain’s house overlooking the harbor. More pix of these beautiful and historic homes follow below. Right after this shot was taken, Larry David (of Seinfeld and Curb Your Enthusiasm fame) drove by. Her’s a distant shot of the busy harbor, light house and Chappy. We made a quick lunch stop for some awesome sandwiches at Humphrey’s Bakery (http://www.humphreysbakery.com) and a fine cup of java from Espresso Love. 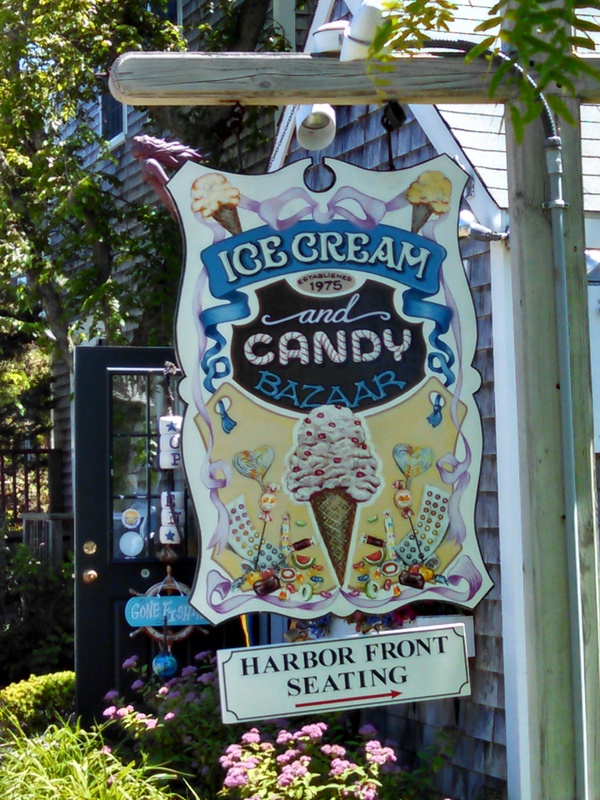 NOTE: If you’re ever in Edgartown stop in to Espresso Love and say “hi” to its irrepressible, high-energy owner Carol McManus, whom Bart and Rorie have known since 1992 when she opened her doors. Since then, her “coffee shop” has expanded into a destination for fine baked goods, sandwiches and more. 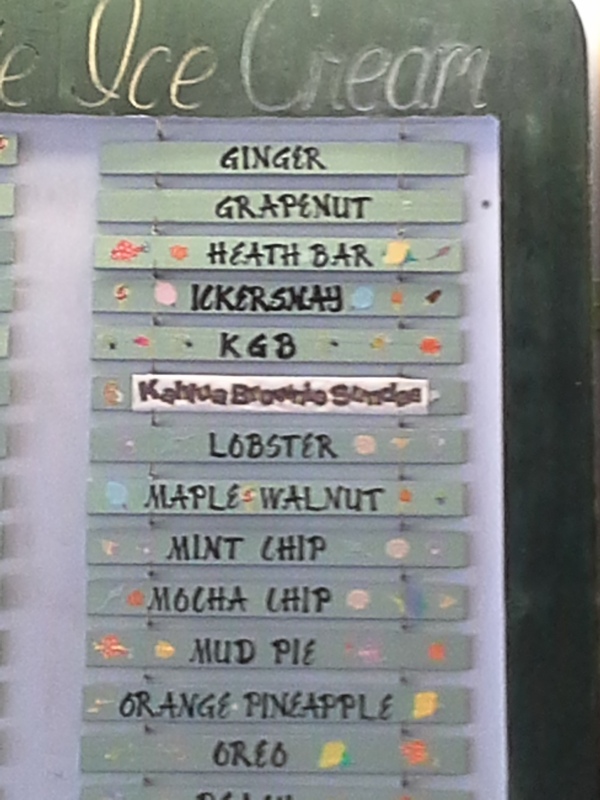 While it has a strong base of Island and visitor customers, Espresso Love also feeds many luminaries too, including Kevin Spacey, Gabriel Byrne, Robert De Niro, Barack Obama, and Bill Clinton. 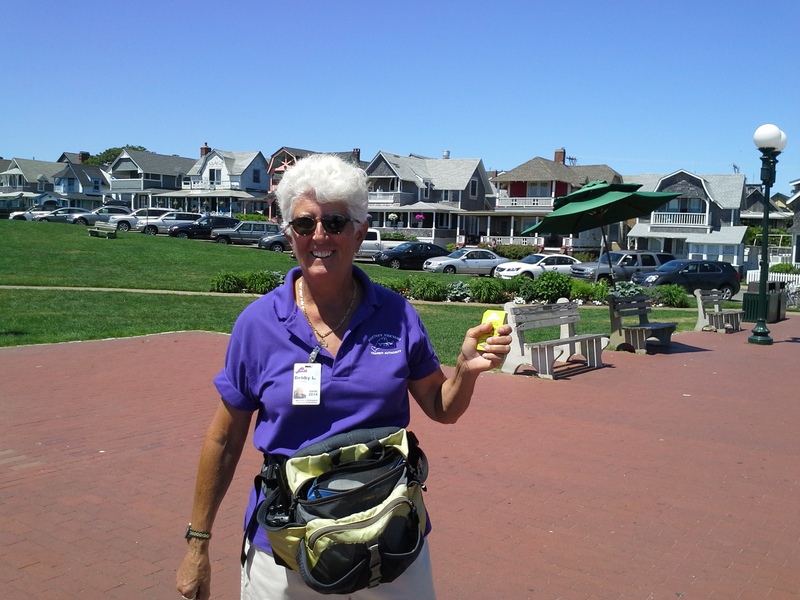 Now fully refreshed, we hopped back on the MV Transit Bus to tour the Town of Oak Bluffs. 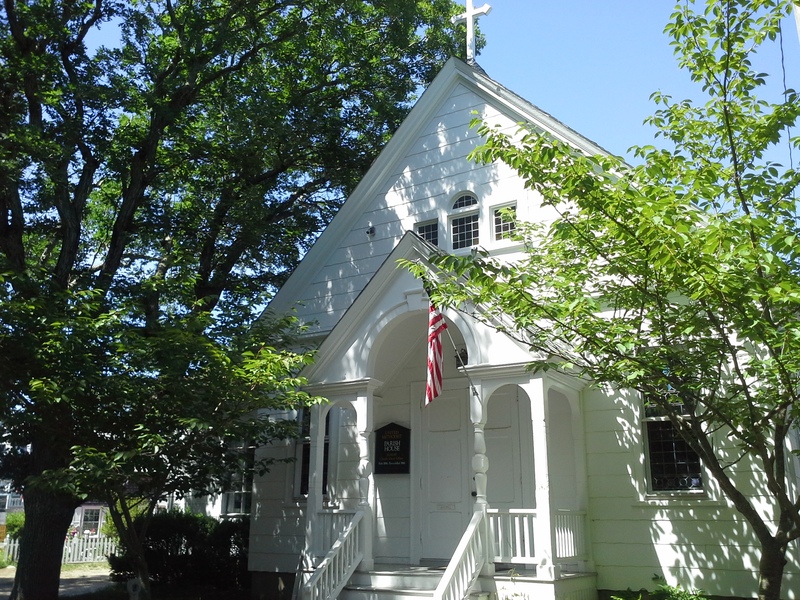 A stroll through this community brings you to an in-town area known as the historic Martha’s Vineyard Camp Meeting Association, formerly known as “Wesleyan Grove”. 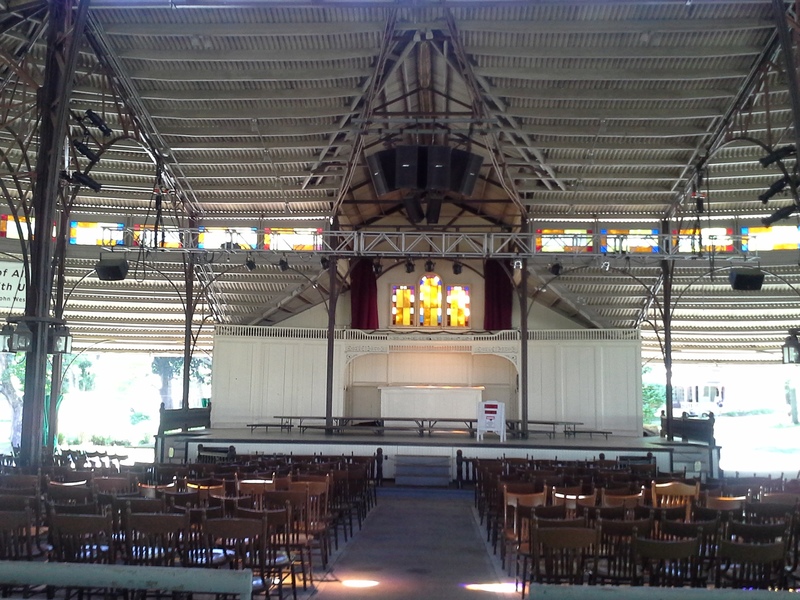 Below are shots of its extremely colorful “Martha’s Vineyard” gingerbread cottages built between 1859-1880, the iron open-air Tabernacle, built in 1879 and one of the community churches. 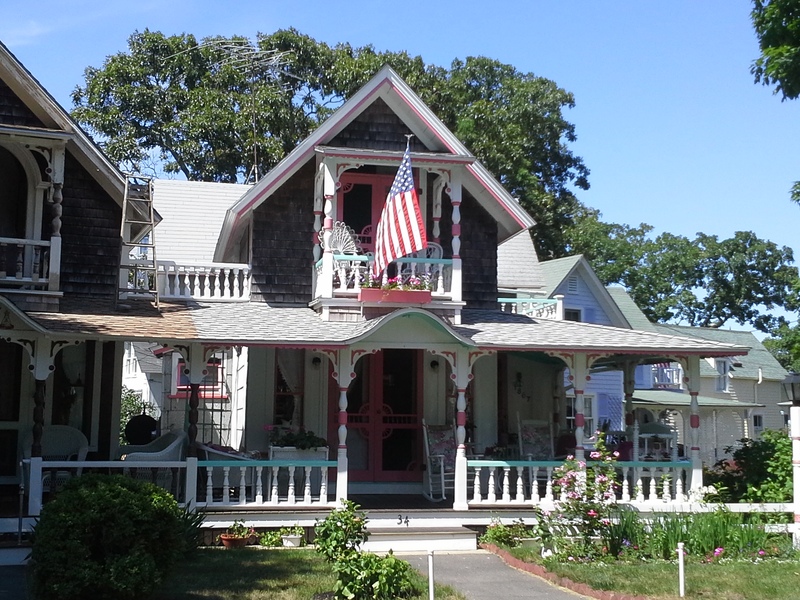 If you’re ever in Oak Bluffs this “neighborhood” is absolutely a must-see (http://www.mvcma.org)! 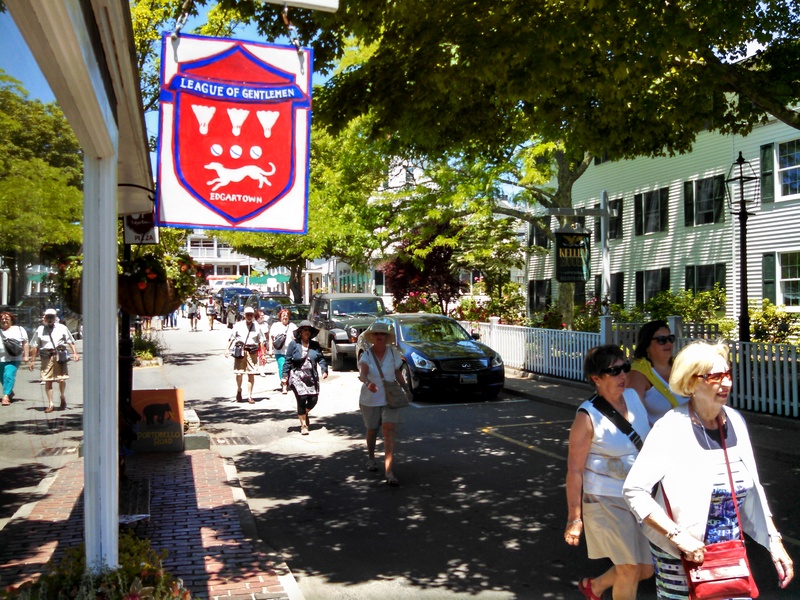 Leaving the Camp Meeting Association grounds behind, we headed back to the main street in Oak Bluffs called Circuit Avenue. 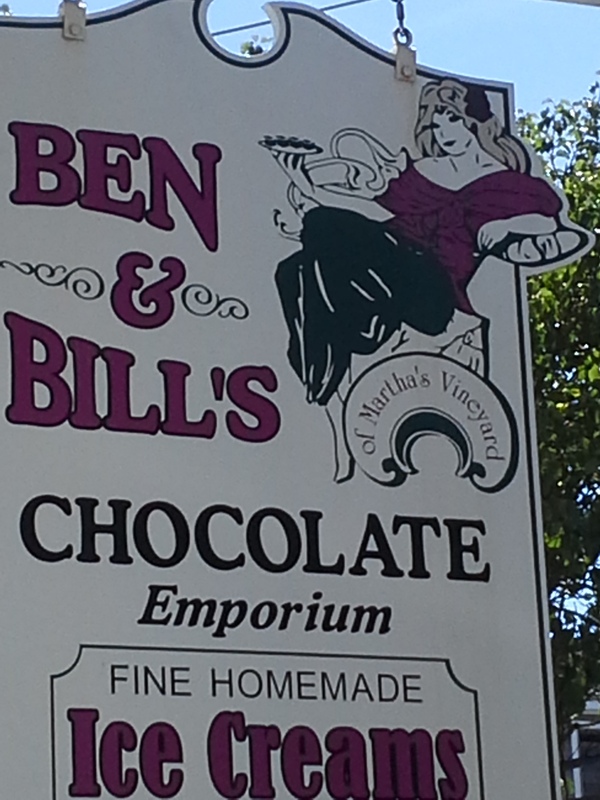 And, lo and behold, look what we stumbled upon…another tempting purveyor of sweets! 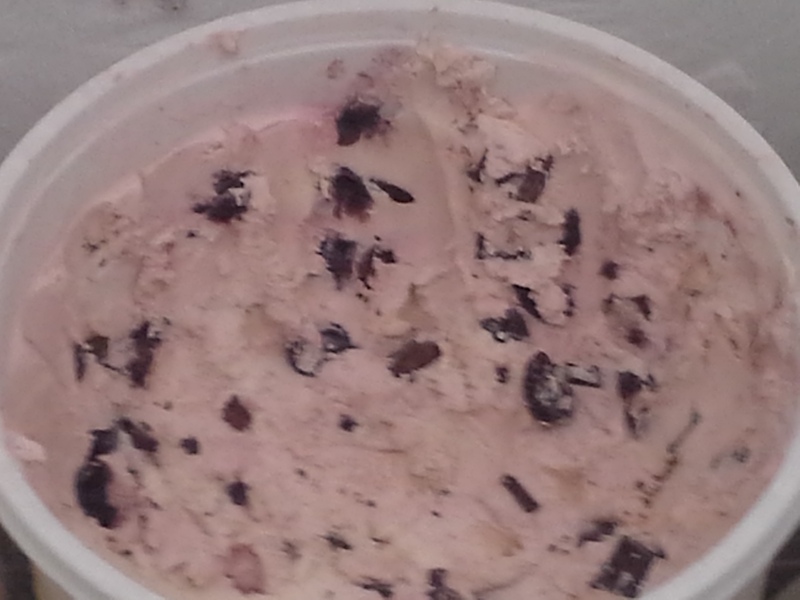 This time Rorie caved (big surprise) and got herself a big old chocolate cherry chunk ice cream cone. 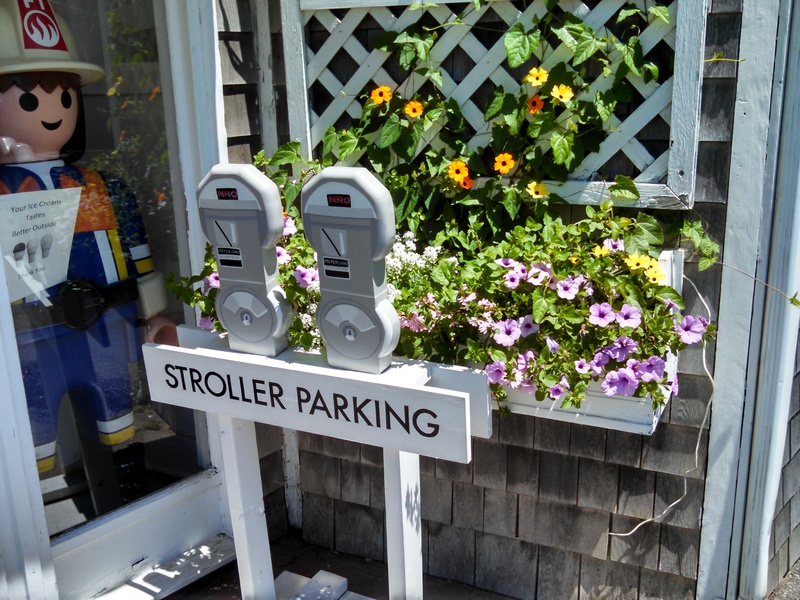 Rorie and Bart continued to explore the shops – and people watch – on side streets of Oak Bluffs before returning to the Island Queen dock for a late PM return trip to Falmouth. 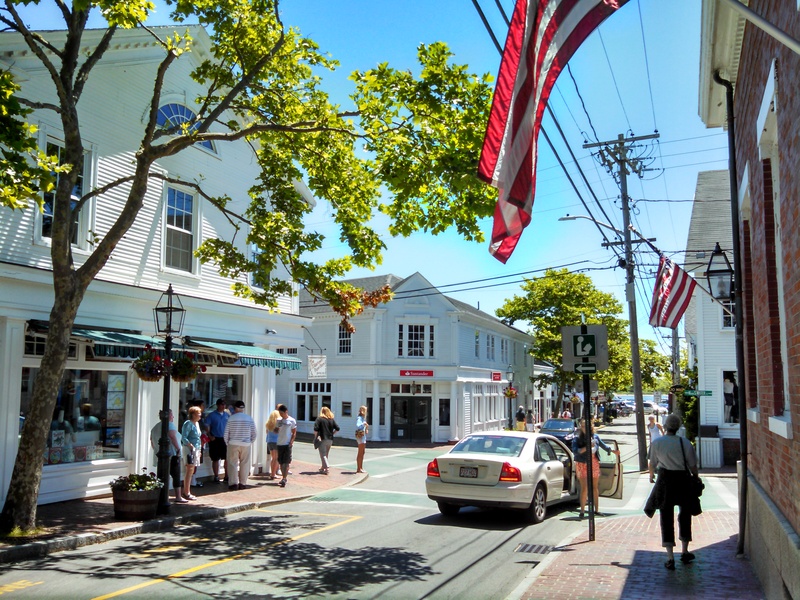 Downtown Falmouth, located at the foot of Cape Cod, is also a very attractive destination. Falmouth is home to the famous Woods Hole Oceanographic Institution, the Marine Biological Laboratory, and the Woods Hole Research Center. 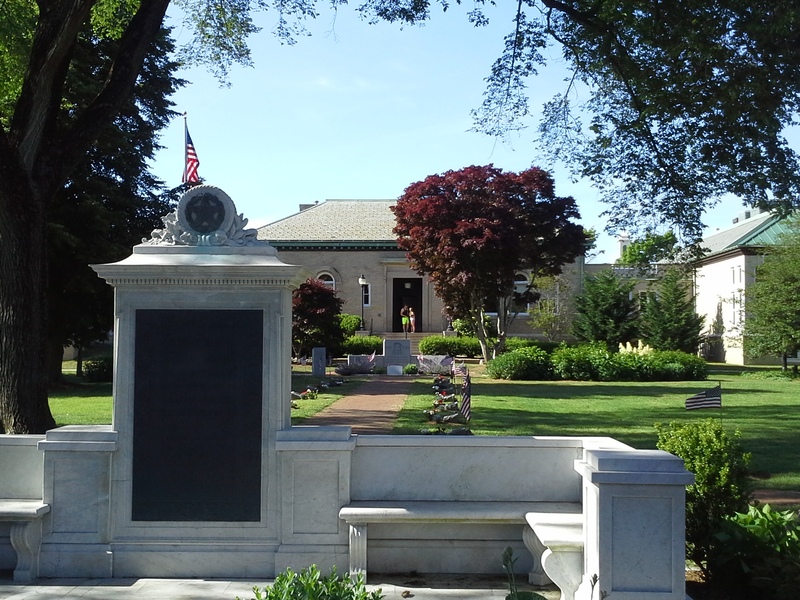 This is a view of the Veteran’s Memorial on the ground of the Falmouth Public Library, which is a stunning structure in its own right. After completing our stroll through downtown Falmouth we headed out to see the town’s beach and what a beautiful beach it is. Fun, sun, eats, sweets, history and amazing scenery. 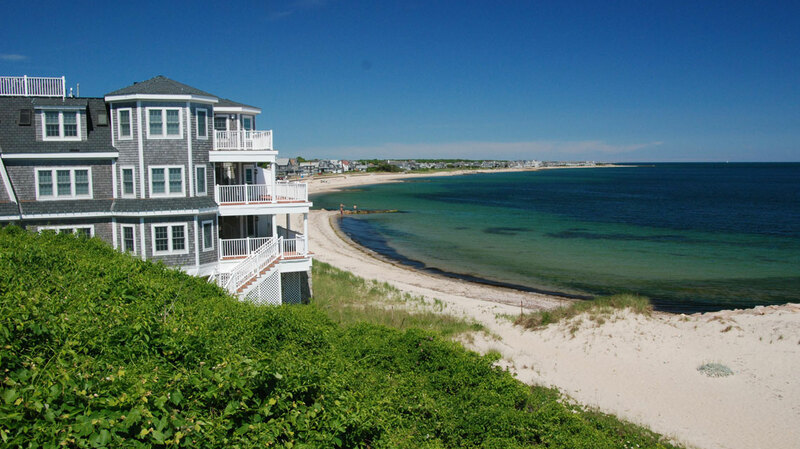 Martha’s Vineyard and the Cape have it all. 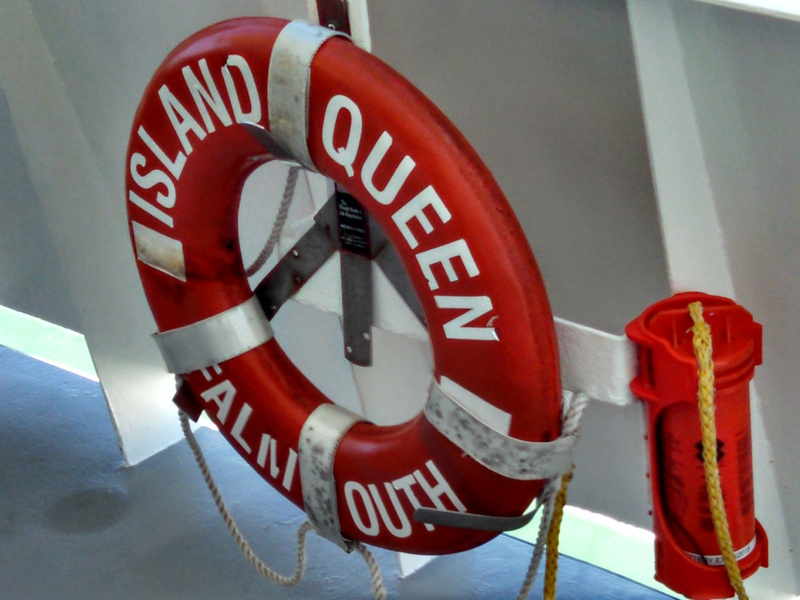 So put on your sneakers, hop on the ferry, grab a seat on the bus and soak up some amazing history and, just maybe, rub elbows with the rich and famous! 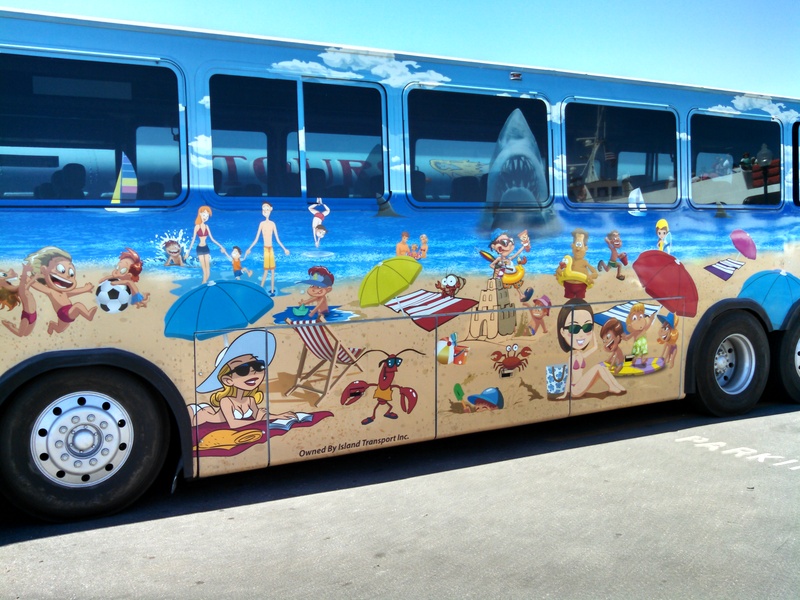 You never know who you’ll run into in one of these seaside small towns! As much as I enjoy the commentary, the photos are really quite wonderful. Keep traveling so I can live vicariously!